Find the perfect motorcycle saddle bag to take on your next road trip. Choose from leather motorcycle hard saddle bags or waterproof PVC throw-over bags that are available in different sizes and styles. We have bags that will fit all kinds of bikers like Harleys, Sportsters and cruiser styles. Don't forget to check out our full selection of motorcycle luggage bags and tool bags. 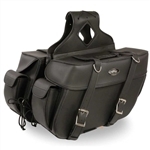 Leather Bound carries a wide selection of motorcycle saddle bags and luggage bags that are built to last and made from high quality materials. We have bags to fit all types of bikes such as Harley-Davidson, Honda, Yamaha and more. Try before you buy! Ride your bike into our Pennsauken, New Jersey location and try out motorcycle luggage bags before you buy to guarantee a perfect fit for your needs.